Cooking with pot has recently exploded. Smoking might be the most common way of consuming cannabis, at least as far as popular perceptions of the herb go, but eating marijuana is also a great way to get the effects without having to light up. In fact, for a lot of people, it’s preferable. 2018 #1 Strains are in stock now. This doesn’t mean that you should just stick a handful of dried herb in your mouth and start chewing. In fact, that’s really not a very delicious way to intake one’s herb of choice at all. There are far too many wonderful and delicious things you can cook with cannabis, and with recipes like pot cookies and pot brownies, the sweetness of the delicacy overpowers the earthy taste of the marijuana to give you a treat that tastes as great as it makes you feel. So what are some of the benefits of cooking with pot? It lets you indulge in public. Or when you’re going to be going out in public. Or any time you don’t want everyone to know about your herbal medicine. Smoking weed makes you smell like weed, but eating cannabis cookies or pot brownies doesn’t make you smell like anything at all. If you are cooking with cannabutter, your place is going to smell like cannabis for a long time while you make the butter. Making cannabutter is an, um, fragrant affair. The good news is that once you’ve made a batch of cannabutter, you can cook with it for as long as it lasts. You can even spread it on your toast! It gives a different kind of high. The high you get from ingesting cannabis is different from the high you get from smoking it. When you cook with marijuana, you get a high that is longer lasting and, some people say, deeper. It feels more like it is throughout your whole body instead of being primarily in your brain. It takes longer to feel the high. Depending on how you cooked your pot and your own tolerance or resistance to the herb, it may take up to an hour to start to feel the effects. 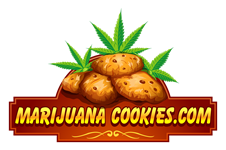 Resist the temptation to light up while you’re waiting for the effects of your marijuana cookies to kick in. Once you start feeling the high, it’ll knock your pants off if you’ve decided to double up. Also, it can be harder to gauge how much you are ingesting if you’re eating instead of smoking. Since it takes so long for the effects to kick in, it’s easy to consume too much, especially if you haven’t cooked with cannabis before. You should plan to not get too much done for the rest of the day if you’re going to indulge in pot cookies or marijuana brownies, because you might end up with a mushier, lazier brain than usual. It is true that there is no lethal overdose level of THC. However, too much marijuana can cause you to make bad judgments. There was recently a case of someone eating a bunch of marijuana cookies and then dying, not because she overdosed, but because she jumped off a fourth story balcony. Just because cannabis is a drug that won’t kill you if you take too much of it, that doesn’t mean you are immune from the effects of bad decisions. Be smart, have common sense, and stay safe, especially if you are taking drugs that may or may not make you feel invincible. It helps to be around people who will help keep you safe, instead of encouraging you to take risks, if you are going to take potentially mind-altering substances. It can extract the THC more effectively from the herb. THC is fat soluble, so it stands to reason that you would be able to get more of it out of your herb if you extract it with fat. This is why cannabutter is so great and so effective: you’re getting a lot more THC than you would even from smoking. 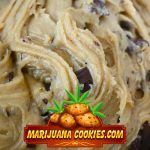 Whether you’re cooking with cannabutter or putting ground up dried herb in your cookie dough, cooking with marijuana is as easy as putting your favorite herb in cookie dough or brownie batter, baking it, and munching. If you’re bringing your happy treats to a party or event, you should let people know what they’re getting into before they chow down. There are tons of creative ways to do this, from drawing little marijuana leaves in green icing on each brownie, to using distinctive cookie cutters to show what’s inside. Cannabis cookies are great, but people should know what they’re eating before they take a bite. Getting people high without their consent isn’t funny, and if someone has a lower tolerance level than you they might get a really bad trip from what would be just the perfect high for you. Feel free to share the joy (if you’re somewhere where it’s legal), but be considerate.